We live in a world where nothing is sacred and nobody in Hollywood has an original idea. The brilliant Let The Right One In gets remade in America and has its name changed to Let Me In, presumably because we must all be too stupid to understand the former’s subtlety. Funny Games gets remade scene for scene a year after the original came out. The Fly remake is being directed by the same person who directed the last Fly remake. This could all be easily ignored if the massive inability to create anything didn’t trickle down from Hollywood into the video game world. Our childhood is turned into terrible movie after terrible movie, only to then be turned into terrible video games through tie-ins. Somebody actually thought “hey, let’s make a video game for The Great Escape” and nobody thought that was a horrible idea. Avatar made 40 billion double dollars at the box office, but couldn’t become a better than average video game. As the list of classics that have avoided the remake curse ever dwindles, it becomes clear we can’t stop this. Movies we loved, indeed the movies that shaped our views on entertainment will be divided into easily digestible chunks and have a cold CGI sheen placed over it. What we need to do is roll with the punches. Video game developers need to take the crap they are handed to tie into whatever movie gets blasphemed next and do whatever they can to fix it. Sure, it is hard to turn crap into gold, many wizards have tried and just made a mess, but it is possible. Movie adaptations have been getting better over the years, but pulling a good game out of a crappy movie tie-in still requires nothing short of perfection. Perhaps it would even take a new dawn of creativity. You are going to realize why that is a terrible pun soon enough. To me, the most blasphemous remake coming down the crap-slicked pipeline is Red Dawn – see, wasn’t that above pun terrible now that you have the context? Like the travesties mentioned earlier, there is just absolutely no reason to remake Red Dawn. While anybody with taste in action movies or 80s cinema was entertained, it wasn’t like it was insanely critically acclaimed. There also isn’t a huge contingent of people sitting in front of the Metro-Goldwyn offices screaming at them to remake Red Dawn in an era where it isn’t remotely striking or relevant, all while changing the plot and making the Wolverines fight the evil Chinese instead of the evil Russians. A Red Dawn game would work if it was true to the Red Dawn we already know. Not ‘Red Dawn 2010 as sponsored by PF Changs’, but the original version. Keep everything exactly the same, complete with Cold War-inspired stereotypes and xenophobic themes. There are just certain movies, or any work of entertainment really, that lose a whole lot of their impact when updated and removed from their original context. Red Dawn worked because it was released during a particularly hairy part of the dwindling Cold War. While China may be a little bit off the rails these days, there aren’t school children duck-and-covering under their school desks because of it. Keeping this in the 80s is as important as keeping H.R. Pufnstuf in the 70s. Although I doubt they will be making a video game version of that anytime soon. To ensure a Red Dawn video game actually does better than the cinematic remake, ignoring whatever said remake does absolutely has to be the first step. Probably the most important step. I mean, outside of making sure the game isn’t garbage and all. But the two kind of go hand in hand. Now, the interesting thing is how we go about handling the actual plot of the game. This is where I find most movie-based games tend to fail. It isn’t about following the movies plot; a two hour movie can’t be stretched into a full length video game without it being ridiculously boring. It is about interpreting the world adequately in an interactive form. This was one thing the Avatar game got right, and one thing a game like Enter The Matrix got wrong. 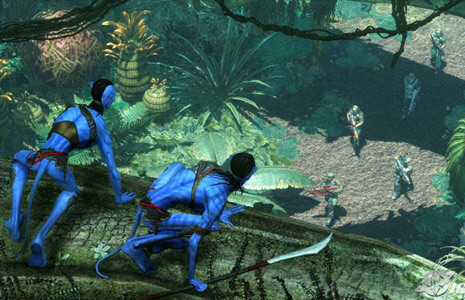 Avatar rightly figured that people would want to experience the world of Pandora and its various locales, but the game stumbled by having a generic story and uninterestingly linear gameplay, simply hiding it well behind fancy graphics. Hmm, I guess Avatar did a good job of capturing the feeling of the movie after all. Anyway, my apparently unpopular opinion aside, a perfect video game blasphemy of a hallowed film would need to figure out what people would want to do the most. Enter the Matrix misstepped severely because, for some reason, its developers figured people would care about a bunch of characters who were barely even extras in the film. So, what would gamers want out of a Red Dawn game? Simple answer: killing a whole lot of commies. All you need is a whole lot of high school kids in the woods with the ability to cause a whole lot of bloody carnage to a whole lot of foreign adversaries. It’s tempting at this point to say that, because World in Conflict got so much right, a Red Dawn game would have to be a real-time strategy game. Thing is, for it to work the scale would need to be shrunk. You aren’t commanding tank battalions. You are commanding a bunch of scared kids with old rifles in guerrilla warfare. That word, guerrilla, is where the real influence is going to come from. The latest Red Faction game did a fantastic job of simply saying “here are some explosives, go have fun” and then providing the means to have a great gaming experience. Red Dawn should follow that same formula. Just replace Mars with Colorado. The game also shouldn’t eliminate the ability to run and gun like an action movie just because guerrilla warfare is the most obvious strategy. Encouraging gamers to keep things slow and quiet could be done by only allowing for a small amount of soldiers to take into battle. It would give players the opportunity to make tactical decisions. An example mission: stop a Russian convoy. Do you bring all your troops and risk leaving your camp undefended or just bring a handful in order to keep things relatively low key? A system like that in Battlefield 2: Modern Combat would be great, allowing the player to use each active character in the battle. By giving the player a finite amount of troops and a large litany of missions designed to weaken the Russian occupation of your home town, players would have to try and keep as many of their soldiers alive as possible. Nonetheless, when things go bad the ability to put a bazooka on your shoulder and rocket through to safety will always be a possibility. Really, they should have just pulled a Ghostbusters and used a video game as the new movie instead of actually wasting time and money on a remake. 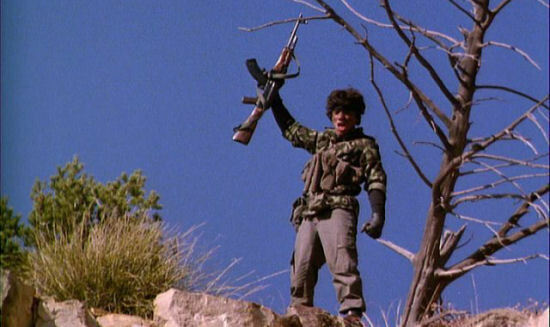 Red Dawn made a great 80s movie, and it would make a great video game if it waskept true to the setting, but it probably won’t hold its water as a 2010 action film. It should also be interesting to see how the game Homefront turns out, as that has more in common with Red Dawn than the remake most likely will. With the guy who actually wrote the damn thing penning the game, that might be the closest thing to a Red Dawn-like experience we are actually going to get. All I ask is that this game utilize voice commands. I can’t think of anything more badass than sitting in my boxers screaming, “Wolverines!” while sending my digital militia into battle. The Ruskies never had a chance.